The Queen of England Elizabeth 11 was born April 22nd, crowned 2nd June 1953, Mayfair London. She celebrates her ‘official’ birthday the first, second or third of June each year with a special ‘Trooping of the Colour’ or her Birthday parade. Throughout history, the monarch has always had their portrait painted. The Queen is no exception. Whilst I don’t agree with the critic, I do think the Queen looks aloof and alone and inaccessable, which I suppose she is in her role. Australian artist and entertainer Rolf Harris had a completely different approach. He wanted his portrait to be more impressionistic than a photographic representation. “I was really thrilled with the impressionistic look, especially the hands,” added the former Animal Hospital presenter. A completely different type of portrait was done by Rupert Alexander. This painting was only done recently this year by the 35-year-old artist. I think it’s a Masterpiece and it will not look out-of-place in the National Gallery. 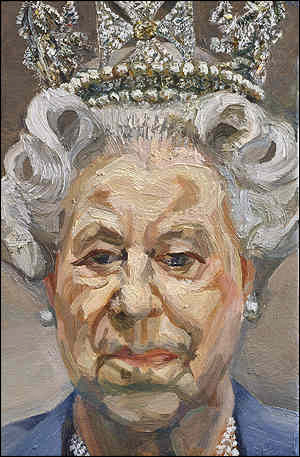 All the artist had was three one hour sittings with the Queen! I have never heard of this artist before – but I shall be looking out for his work in the future. Commonwealth, including great Zimbabwe, Sydney Opera House and the Taj Mahal. 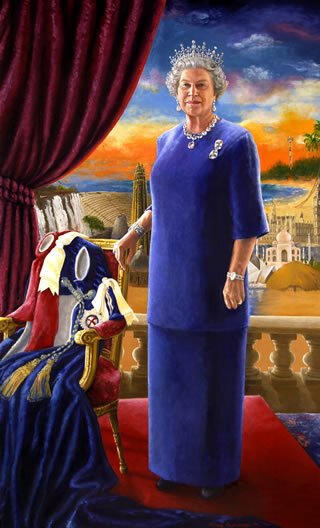 She has made the Queen very tall and regal in her rich blue gown. 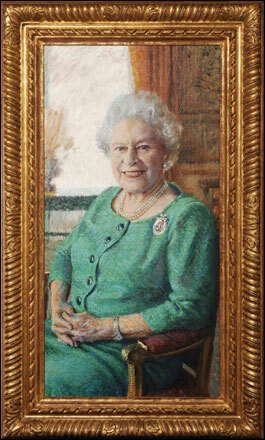 The whole portrait is lit up with sumptuous colour. This portrait is by one of my favorite artists – Lucien Freud. You either love it or hate it – I LOVE it of course! He has not flattered the monarch at all, but he has captured her humanness beneath the dazzling crown. 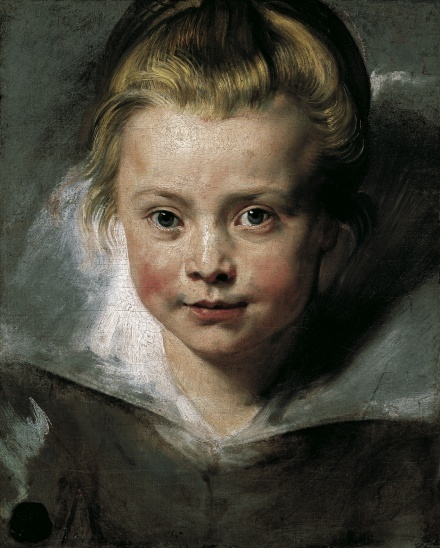 Each painterly stroke tells of a life of duty and patience, indeed she does look a little weary. Which of these portraits do you prefer and why? This entry was posted on June 1, 2010 at 12:02 am and is filed under ART, ART HISTORY with tags Annie Liebovitz, Chinwe Chukwuogo-Roy, lucian freud, portraiture, Queen elizabeth 11, Rolf Harris, Rupert Alexander. You can follow any responses to this entry through the RSS 2.0 feed. You can leave a response, or trackback from your own site. the Rupert Alexander is definitely my favourite. It feels so true, like she’s looking right at me! And it’s honest, striking a balance between her humanness and her authority. I also like the simplicity of it. Great post. We have the Queen’s birthday holida weekend coming up – and, coincidentally, I am going to Queensland for that week! We don’t really want the Queen as our head of state, but we can’t give up the public holiday! Not my fave (It’s Freud for me but BUT I do LOVE this) stunning in it’s own right Kirsty! The humaness does indeed shine through. It makes me question what the past Court painters actually intended in their art? What was truth and what was de rigueur? We may be closer to what they actually thought and (though they are our maps). The fact that we are actually confident/competant enough to see through the ‘flattery’ these days does allow us to to judge and read between the lines. I wouldn’t have predicted my reaction in advance, but I do find myself looking at the photograph more. 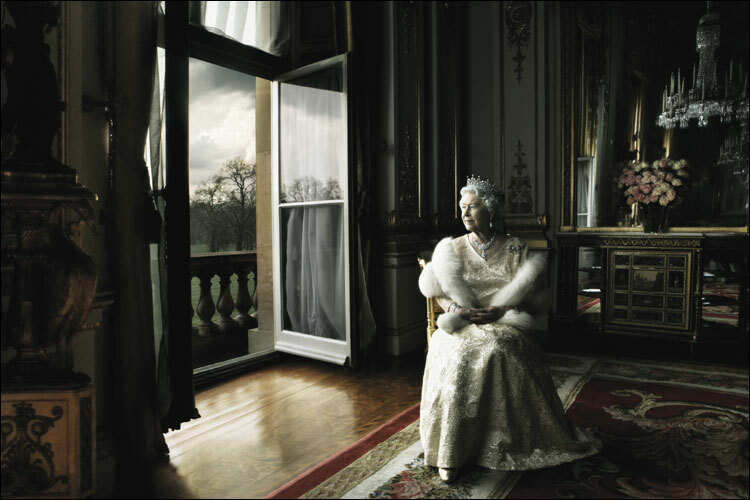 Maybe its the space she occupies or just the fact it’s a gorgeous photograph, but I think Leibovitz’s image does capture something about the “court portrait” which this photo was intended to do. I like Freud’s art, but this portrait isn’t one of his better works. I think he whiffed a bit on this commission. He wants to be Bacon on this one, but couldn’t go that far in the end. As a prediction…probably the Freud since he and Leibovitz are the two artists in your post that I’m familiar with. Years ago when i actully watched tv. I saw the program where rolf harris was doing this piece. i’m just waiting for an artist to do an abstract one. These are all fantastic works. But i wish they didn’t take the queen image so seriously. Imagine an abstract of the queen dressed up as a jester and (queen victoria ?) saying i am not amused in a speech bubble. I remember that programe K! It was really good, I like Rolf Harris, as well as being a good artist in his own right, he has fun with art too. An abstract Queen eh – dressed up as a jester 🙂 🙂 we ARE amused:) I bet someone does this now!! Well, Lucien Freud’s, of course! He is, by far, my favorite figure painter in oil! He renders the human form as though it has experienced life and gives the skin an appearance of being lived in. The glory is in the strength he gives his people as if they really have souls and they don’t need to be made more beautiful because they already are. I love this painting and often open my Freud book of images of his paintings and look at this one. She, not only looks wise, but believable. Do you see the heart on her forehead? I love that. I have his lengthy interview from You Tube saved in my favorites and link to it often just to hear him speak. I like his view of art, the figure and his quiet and peaceful demeanor. This is a great discussion. I don’t mind Bacon’s work because it makes me stop and look. I have kind of figured that my interest in his work is more “Why did he do that?” and “Look at how he did that!” and “How gross!” and “Creative.” where with Freud it is all there and makes me feel and I sense what he was saying and I identify with his brushwork. He seems like he doesn’t need to use a gimmick to say, “These are people I have seen.”….and I like that. Bacon’s screams and has a presense that can be felt, its as if he has imprisoned a moment or tricked his subject under the paint and they are screaming to get out! Auerbach’s paintings are understood intuitively, as if you are conversing with a voice beyond the paint, the more you look at his painting you intuitively understand why he painted the same portrait day after day – it’s quite remarkable. Freud’s paintings are also intuitive – not only does he understand his subject, he shows the inner as well as the outer being – and that is a rare talent. So I’d say he ‘whispers’ and reveals his subject. Chinwe Chukwuogo-Roy’s portrait is without any doubt in my mind the best of this group. It does need to be seen at close quarters to really appreciate. I’ve had the benefit of seeing it in the flesh and it is a delight and certainly makes a lie out of Brian Sewell’s somewhat negative comments (which he made without even looking at the work! Poor chap, can’t seem to stand women artists). 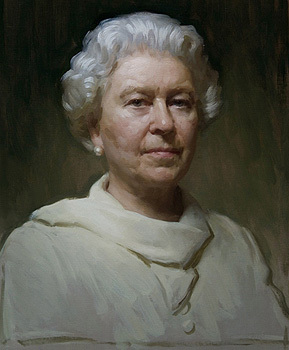 Actually the study, which is in the Queen’s collection is a more satisfying portrait of her face, but the colour and attention to detail in this portrait is brilliant, and I rarely say that.